This square leg outdoor table has two unattached seats that can be in-ground or surface mounted. The top and seats are thermoplastic coated # 11 ga. punched steel to withstand all weather conditions. This rectangular outdoor table is both durable and safe, with round corners on the top and seats, and heavy-duty 4" x 4" powder-coated square legs. 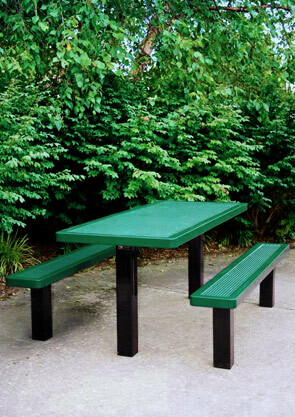 Top and seats are thermoplastic coated in lightly textured Polyethylene finish. Universal Access models of this rectangular outdoor table are also available in 6', 8' or 10' models. ADA approved, these Universal Access models provide comfortable wheelchair access and clearance with one 2' overhanging side. 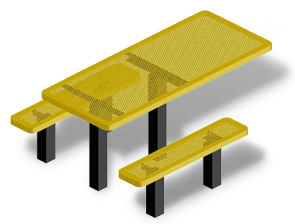 All wheelchair access octagon picnic tables, conform to latest ADA specification.